Here in Atlanta, school ends before Memorial Day. It starts back in early August. That makes July the middle of the summer for me and my students. It’s important to use this time wisely. You know how it goes after school starts back. You’re caught in an endless cycle of Sundays and Wednesdays, with a few special events mixed in. It’s important to get ready now so you can give students your best when school starts back. That’s what these 4 things are all about. Get ready now so you can give students your best when school starts back. 1. Do something you enjoy. One way to get ready is to get recharged by doing something you enjoy. Preferably outdoors. If you enjoy golf, then go play a few rounds. If you like the pool, then go there. If you’re a lover of the beach, then plan an overnight getaway. Maybe it’s fishing. Go do it. I enjoy taking walks with my wife and kids around our neighborhood after dinner. Thanks to Daylight Savings Time, the sun doesn’t go down until almost 9:00 where I live. That leaves us plenty of time to eat dinner, grab a popsicle, and take a walk. A good fiction book is hard to beat, but this is primarily about personal development and growth. 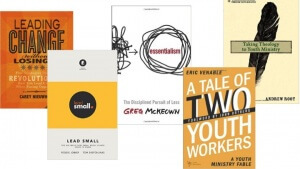 In the middle of the summer, you have the margin to consider ideas and strategies that you don’t normally have time to consider in the middle of a busy ministry season. 3. Meet students for lunch. 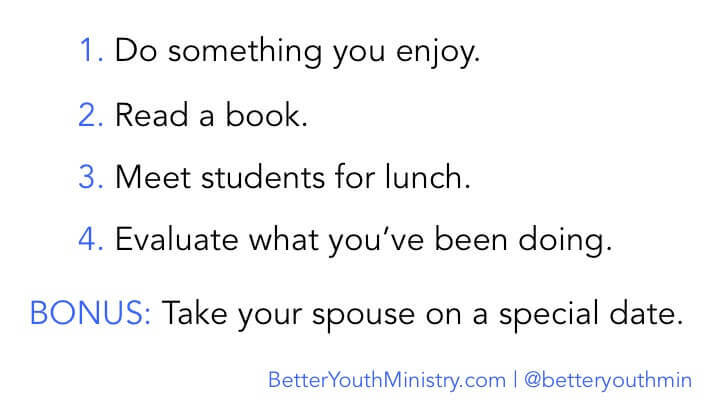 You got into youth ministry because you wanted to make a difference in students’ lives. Unfortunately, that desire to make a personal difference can get lost in the details and demands of being a professional youth pastor. Now’s your chance. The month of July provides an opportunity to meet students for lunch and connect with them on a personal level outside of church. Most of them are just sitting at home with nothing else to do. You’ll be their new hero when you invite them to join you at Chick-fil-A for lunch…your treat! 4. Evaluate what you’ve been doing. Throughout the year, you work in the ministry. That means you’re in charge of planning services. You’re responsible for writing messages. You’re the person planning special events. You’re the one training volunteers. All of those things are necessary. They’re part of youth ministry. But it’s important to step back and take another look at what you’re doing. 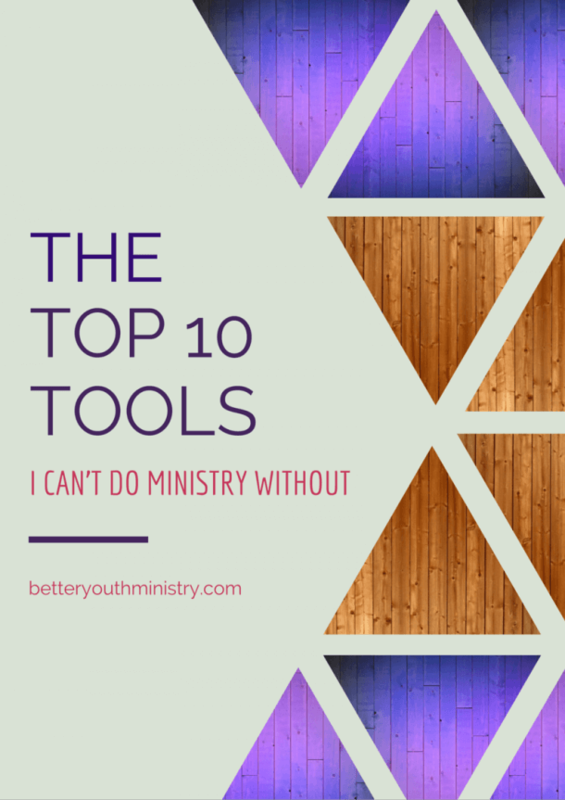 You need to work on the ministry. That means you need to consider whether or not there’s a better way to do what you’re doing. Are you accomplishing what you hoped you would in your large group times? What’s one thing that would make it better? Are your volunteers doing a good job? How can you help them feel appreciated? How do you follow up with new students? How are you helping students take the next step in their faith? The middle of the summer is a great time to think about questions like these. The answers can help you accomplish more in the coming school year than you did in the last one. BONUS: If you’re married, take your spouse on a special date. Your spouse makes a tremendous sacrifice during the year. There are several nights when your place at the table will be empty because you’re working at the church. That’s just how it is. When other people are off, you’re on. This is ministry, after all. So, go the extra mile this month. Plan a special date for just the two of you. The month of July provides you with an opportunity to recharge and get ready for a brand-new school year. Don’t wait. Take time to do something you enjoy, read a book, meet with students, and evaluate what you’ve been doing. That way you can give your students your best when school starts back. 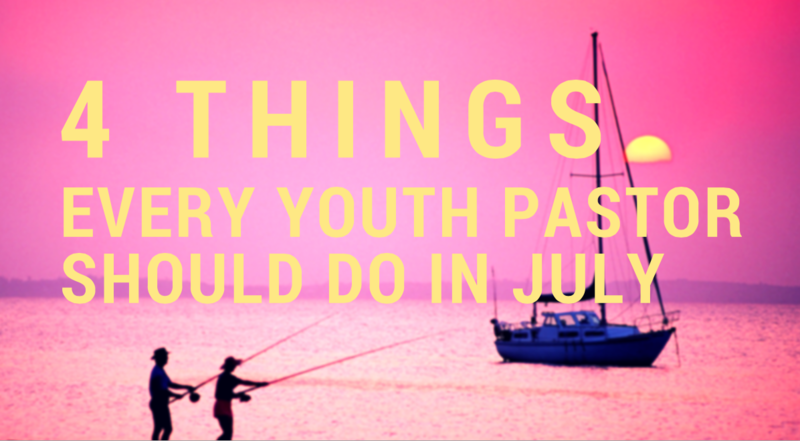 What is one thing you do over the summer to get ready for the next school year?